Now through May 31, Terminal Parking on weekends is only $10 per day. Details and FAQ's can be found here. Parking must be purchased at least one hour prior to airport arrival. Parking cannot be prepaid less than 1 hour in advance. To see available parking options at DFW, click here. How do I use my prepaid parking to enter the airport? Once you have received your booking confirmation, you can relax knowing that your parking needs are covered. You may enter DFW Airport up to 4 hours prior to your booked entry time and exit DFW Airport up to 4 hours after your booked exit time with no additional charges. Enter and exit DFW Airport as normal using the car and identical TollTag associated with your visit. Your TollTag will be only be associated with your prepaid parking confirmation and will NOT be charged for your parking stay. Your TollTag allows you the fastest entry and exit to/from DFW Airport. Any time exceeding 4 hours of your booked exit time will be charged to your TollTag at posted parking rates. Click HERE to see a short video of how to use prepaid parking with your TollTag. The light on the QR Reader will turn green when the QR Code is read successfully. Click HERE to see a short video of how to use your prepaid parking. Upon entering DFW Airport park in the parking location (Terminal or Express) that you prepaid for. Parking in excess of prepaid parking periods will be charged at DFW Airport posted parking rates and will require payment on exit. What happens if my trip is extended? Modifications to your reservation must be made at least 1 hour prior to your booking arrival time. Time extended at either end of your visit will be charged at the appropriate parking rate. If I have questions or concerns, whom can I contact? Cancellations made at least 12 hours before booking arrival time will receive a full refund. You will need the reference number from your payment confirmation email and the email address you provided during the payment process in order to access this file. There will be no refunds for cancelations made less than 12 hours before the beginning of your scheduled arrival time. No refunds are provided for trips that are shorter than the period of time scheduled online. If you purchased your parking online from any entity other than AIRPORT (such as an AirportAuthorized Reseller) and you require a refund or cancellation, you must seek that refund or cancellation from that other entity. I prepaid online; do I have to go to the parking lot in my reservation? Is there a special area I should park in and is my spot reserved? You must park only in the parking product specified in your itinerary i.e. Terminal, Express Covered, Express Uncovered, or Remote. If prepaying for Terminal Parking and you specified a specific Terminal you must park at the Terminal paid for unless directed by notification to park in a different Terminal. You will not be assigned to a specific parking space, but one will be available for you. Click on the "Continue" button. Step 4: The system will check parking availability for the dates and times specified by you and will display available parking options, prices and indicate savings from the normal parking rates. Step 5: Check that the dates and times shown in the box above “Select a location” are correct. If any of the information you may edit it and receive applicable options available. Step 6: If you have questions concerning the parking facility offered please click on the “More information and map” link above the Select button. Step 7: Select your parking choice among the options presented. Step 8: Complete the “Your Details" section by inserting the required information into the boxes provided. Please ensure that the details you provide are accurate. You will be required to enter the license plate details of the vehicle you will bring to DFW Airport. Please ensure that the license plate details you enter are those of the actual vehicle you will use on your parking visit. Has a valid NTTA TollTag with an NTTA account backed by a credit card. Step 9: We encourage you to register an account. This is not required but will expedite your next booking and allow you to get special offers and coupons for future parking. Step 10: Complete Payment Method information and submit card payment by inserting the required information into the boxes provided. Please ensure that the details you provide are correct. What if I selected TollTag but a QR code printed on my confirmation? This indicates that DFW Airport was unable to identify your TollTag. Please print the confirmation. Please review the license plates listed on your NTTA account at https://csc.ntta.org/olcsc/index.jsp and update the license plate associated with the vehicle’s TollTag. DFW will periodically check the NTTA records and send you an e-mail confirmation if DFW is able to identify your TollTag. What if I don't receive a payment confirmation at the end of the process or a payment confirmation email? In this case, the payment has not been completed successfully and the process should be carefully repeated. If you completed the online process successfully, but did not receive an email confirmation please ensure that your virus checker is not blocking certain emails or classifying the email as spam. Please make sure to store your payment confirmation reference number. Using this number you can check your itinerary online before you travel. Modifications to your reservation must be made at least 1 hour prior to your booking arrival time. Cancellations made at least 12 hours before booking arrival time will receive a full refund. How do I know my prepaid parking payment has been accepted? These confirmations set out the details of your itinerary and include your unique prepaid parking reference number and if applicable, a QR Code. The online payment system won't work for me, what do I do? Please repeat the process from the beginning and ensure that you have followed the procedures set out. The system will prompt you in the case of some errors. The system will advise if prepaid parking is available on your selected dates. In the payment details section ensure that you have clicked on the box opposite 'I have read and accept the Terms & Conditions' to confirm that you have read, understood and agreed to be bound by the terms and conditions. 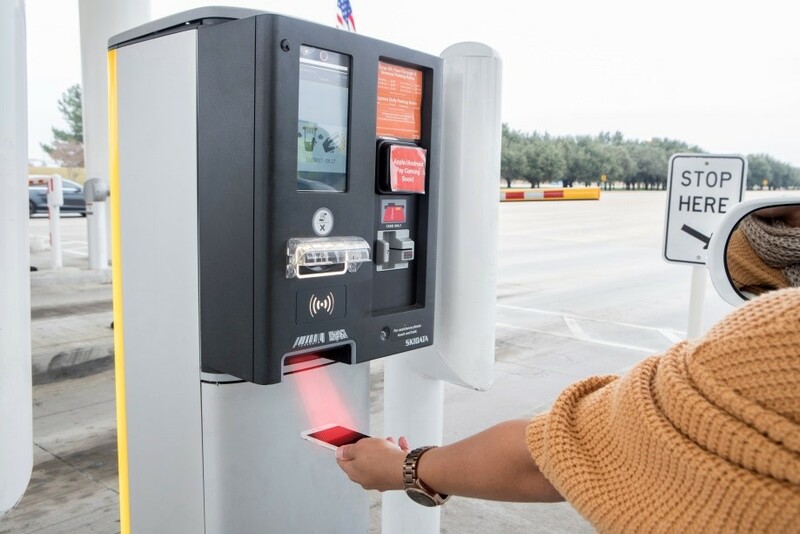 What types of parking are available through the DFW Airport Prepaid Parking system? When I prepay online, can I use a debit card? You may use a debit card to pay for your parking reservation if it has the Visa or MasterCard logo and can be used as a credit card. How does DFW Airport know my TollTag information? DFW Airport retrieves your TollTag number by cross-referencing the license plate provided during your online payment and the NTTA’s recorded license plate/TollTag associations. When you make your online payment ensure that your NTTA records are updated and all license plate/TollTag associations are accurate. If DFW is unable to identify a TollTag with the License Plate provided in your online payment, you will be issued a QR Code to use to enter and exit DFW Airport. USE OF A DIFFERENT TOLLTAG THAN THE TOLLTAG ASSOCIATED WITH YOUR ONLINE ITINERARY LICENCE PLATE DURING YOUR PARKING STAY MAY RESULT IN PARKING FEES AT POSTED RATES ASSESSED TO THE TOLLTAG USED DURING YOUR PARKING STAY. I need a receipt for my parking. How do I get one? Your prepaid parking confirmation will include the amount paid and will be your receipt. I entered a different license plate when I prepaid online than the car I will now be driving to the airport. What happens? Modifications to your reservation, such as your license plate, must be made at least 1 hour prior to your booking arrival time through the "Find my purchase" link on the DFW Airport Prepaid Parking site. This change can be made with no additional fee. If you enter DFW Airport with a different license plate than is reflected in the itinerary record, your online prepayment will not be honored and you may be charged at the posted parking rate. No refund will be issued for your original booking. My trip was shorter than the period of time that I prepaid online – do I get a refund? No refunds are provided for shorter stays. When I prepay online will I be charged right away or when I exit the parking lot? Your credit card will be charged at the time of payment. Where can I find the Prepaid Parking Terms and Conditions? The Terms and Conditions of parking can be found here. Can I prepay for disabled parking online? Disabled parking is available for holders of valid permits or license plates in all of our parking lots. Disabled parkers can prepay for parking, but a Disabled parking space cannot be reserved in advance. Is it possible to amend an itinerary? Yes. Modifications to your reservation must be made at least 1 hour prior to your booking arrival time. The prices charged for the new itinerary will be based on spaces and products available at that point and may not include the same prices as offered when the initial itinerary was made. Step 1: Click "Cancel or Modify My Booking" button in confirmation email. Step 2: You will need the reference number from your payment confirmation email and the email address you provided during the payment process in order to access this file. After entering the reference number and the email address, click the "Find my purchase" button. Step 3: Click the "Modify Purchase" button below your prepayment details. Step 4: Enter new search criteria and click "Search" button. Step 5: Select updated product. Step 6: Confirm your details in the Amendment Summary box. Click "Continue" to confirm changes. Follow steps 2 - 6 listed above. A new confirmation email will be sent with the updated details. This will also include a new booking reference number. The new reference number is the only number that will be associated with this confirmed prepayment. What do I need to bring with me when traveling to DFW Airport? If you received a QR code you must use it to enter and exit DFW Airport Terminal and Express lots. What do I need to do when I arrive at DFW Airport? Proceed into DFW Airport as normal through any lane indicating TollTag entry. Scan your confirmation QR code using the Barcode/QR code reader on the entry ticket dispenser. Press the Intercom button on the entry device to speak with a representative who will verify your prepaid itinerary and raise the gate. ON EXIT, please scan your QR code to exit. Can I use the same credit card for more than one reservation? Can I prepay online for parking in all DFW Airport parking products? DFW’s online parking tool offer’s Terminal and Express parking products dependent upon their expected availability during the period you wish to book. Not all products may be available during the period you wish to book. How close to my date/time of travel can I prepay for parking? Parking must be purchased on the DFW Website or Mobile App at least 1 hour prior to your booking arrival time. What methods of payment can I use to prepay for DFW Airport parking online? VISA, Master Card, American Express or Discover. I have a question about the parking charge on my card. What should I do? How far in advance can I prepay for parking? You may prepay for parking up to nine (9) months in advance of your planned arrival date/time at the Airport. What is the minimum length of stay required to prepay for parking? Your parking itinerary must be for 6 hours or greater. The maximum parking stay is thirty (30) days. Any vehicle left unclaimed in excess of thirty (30) days, in the absence of special arrangements with DFW Airport, may be removed at owner’s expense in accordance with DFW Airport’s Abandoned Vehicle Policy. How do I know my prepayment details are secure? What are the normal parking rates at DFW Airport? (1) All Parking fees, excluding valet parking, include sales tax. The sales tax is based on applicable tax jurisdiction. Our daily prepaid pricing is calculated in 24 hour periods. Beyond 24 hours and under six (6) hours, normal hourly rates apply. There are no additional fees in prepaying for your parking stay. Will sales tax be added to my parking prepayment total? No, DFW ensures that all sales taxes are included in the price quoted to you. Others tend to charge fees outside of their advertised price. I want to prepay online and to pay in foreign currency using my credit card. How will the foreign exchange rate be applied to my booking? Do I have to pay a fee to change or cancel my itinerary? Modifications to your reservation must be made at least 1 hour prior to your booking arrival time. Cancellations made at least 12 hours before booking arrival time will receive a full refund. What happens if I forget my prepayment reference number? Are there any restrictions on the type of vehicle I bring to the parking facilities? DFW Airport parking utilizes standard size parking spaces. Parking garages have varied clearance heights. DFW Airport parking is unable to accommodate oversized or high profile vehicles. What happens if I arrive before the entry time I specified when creating my itinerary online? There is a four (4) hour grace period for entry prior to your online itinerary scheduled entry time. If you arrive before this grace period, you will be charged the length of the stay before the grace period at DFW Airport’s current posted parking rates (these rates may vary from the rates quoted via the online system) and you will not be entitled to a refund or credit on those charges. What happens if I arrive at the entry to Express for my prepaid parking facility and a sign says that the lot is full? The "Full" sign is for the information of customers who have not prepaid for their parking online. Drive forward the system will identify your itinerary via your TollTag and the gate will open. Drive to the parking entry barrier. Present your QR code and the system will read your QR code. Provided the QR code details match those in your itinerary the barrier will rise and you may enter the parking facility. Should this fail for any reason, use the intercom button located on the entry device and a representative will assist you in gaining entry. What happens if after entering the parking facility I need to leave and re-enter the parking lot again? Once your QR code or TollTag is detected exiting the parking facility, your itinerary will be treated as being complete. Should you re-enter the parking facility, this will be treated as the start of a new drive up transaction. Standard drive up parking rates will apply.